So, it was a sunny Sunday, May 24th of this year, and my lovely wife Lisa and I were having lunch here on Roosevelt Island with a couple of writer pals, David Muhlfelder and Robert Thielke. All four of us had ordered burgers and, as we wolfed them down, some other guy showed up at out table, a guy I didn’t know, and he immediately lambasted our diets. Which was fair. But then I fell asleep and everything changed. Not during the lunch – that would have been rude. But after Lisa and I got home, I took a quick nap (our dog gets us up way too early) and suddenly the whole first chapter of a new book came to me while I slept, as well as the main character and the basic plot. I woke up on fire – and Lisa was looking at me as though I was nuts, which isn’t that unusual, I’ll grant you. That week, I started writing DARK SKY and, two and a half months later, it was done. And sleep continued to be my biggest writing helper. I kept waking up in the middle of the night with the idea for the next chapter and then lay there in bed for a couple of hours working out the mechanics. But it was worth the ongoing exhaustion. When I was done, Lisa went through the manuscript and helped me make some significant improvements, and then my talented son A.J. did the book cover design. In this house, everything’s a family affair. The result was DARK SKY. I’m excited about this book and I hope everyone reading this will give it a read. I’d love to write a whole series of these books with the same main character and I already have a plot for the next one. But people have to like this one first before I get crazy involved with another one. That’s why, for now, I’m sleeping on it. Anyway, DARK SKY is NOW on sale on Amazon in paperback and Kindle ebook editions…check it out here if you want. ← a little mid-august creativity. 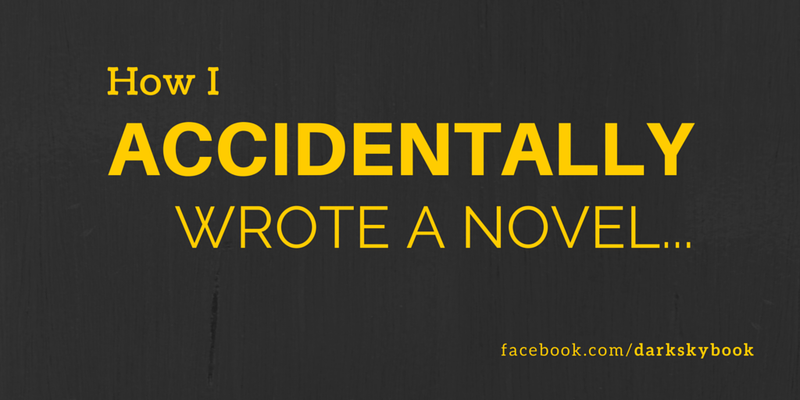 Good luck with your accidental novel! Things often happen in ways we’d never expect.